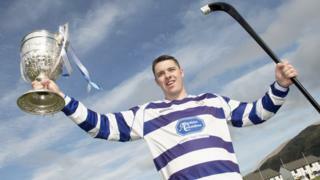 Image caption Sgiobair a' Bhaile Ùir, Steafan Dòmhnallach, is Cupa na Camanachd. Thill Cupa na Camanachd a Bhaile Ùr an t-Slèibh uair eile is iad a' buannachadh 1-0 an aghaidh Camanachd an Òbain aig an Àird. Air là breagha sa Ghearasdan, rinn tadhal tràth sa gheama an gnothach dhan Bhaile Ùr. Cha robh fiù 's trì mionaidean air an cluich nuair a chuir Glenn Mac an Tòisich am ball dhan lìon. Chruthaich Evan Menzies an cothrom, às dèidh mearachd bho Ghavin Stobbart eadar na puist dhan Òban. Bha làmh an uachdair aig an dà loidhne dìon às dèidh sin, is cha robh na bha sin de chothroman ann. Chrìochnaich an geama 1-0, is teann 's a bha an geama, bha sgioba Bhàideanach airidh air a' chupa. Tha Baile Ùr an t-Slèibh a-nise air prìomh dhuais na spòrs a bhuannachadh 31 turas. Tha Cupa MhicThàmhais aca mar thà air an t-seusan seo, is a h-uile coltas ann gum faigh iad an lìog a-rithist cuideachd. 'S e bristeadh-dùil a bh' ann dhan Òban, ach tha an sgioba òg aca air adhartas a dhèanamh am-bliadhna, is faodaidh iad a bhith misneachail gun tig cothroman eile dhaibh anns na bliadhnaichean ri tighinn. Nas tràithe air an là, bha soirbheachas ann dha Camanachd an Eilein Sgitheanaich. Thog na Sgitheanaich òga Cupa Choinnich MhicMhaighstir, le pronnadh 7-0 a thoirt air Ceann a' Ghiuthsaich.